Despite the onslaught of media propaganda in support of the Obama administration’s anti-second amendment agenda in the aftermath of the Sandy Hook school shooting, the statistics clearly illustrate that gun control does not reduce violent crime and in fact has the opposite effect. As the graph above highlights, according to the latest figures obtained by the FBI, violent crime offenses in the United States have been falling since 2007. The five year trend clearly shows that, despite there being an ongoing national debate about gun violence in America, violent crime itself is actually becoming less of a problem. The graph below from the Department of Justice also highlights the fact that over the last 40 years, the amount of guns in America per 1000 people has increased, whereas serious violent crimes have decreased. In addition, despite the media drumbeat that murders involving guns represent the number one safety threat to American citizens, the reality is completely the opposite. Amongst the “top ten killers” in the United States, homicide by firearms is at the bottom of the list, according to figures from the CDC and the FBI. Almost 20 times more people die in the United States from medical errors than they do from firearm homicides, but there is no outcry to slap draconian regulations on the medical industry. In addition, the number of murders committed with hammers and clubs in the United States routinely outpaces the number of homicides committed using a rifle. Should US lawmakers introduce urgent legislation to outlaw hammers and baseball bats? The figures clearly illustrate that rising gun ownership does not cause a rise in violent crime. Look at Chicago, which in 1982 passed a ban on all handguns except for those registered with the city before the ban was enacted. 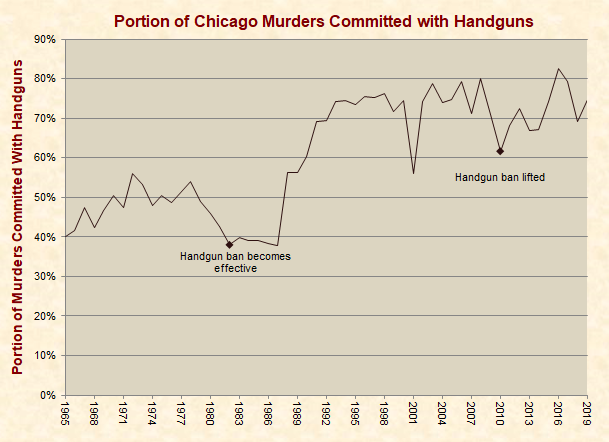 Since the handgun ban took effect, the number of murders in Chicago committed using handguns has been 40% higher than before the ban, and has spiked even higher in recent years, proving that the gun ban actually served to cause an increase in violent crime. In comparison, let’s take a look at Britain, which has some of the strictest gun control laws in the developed world. Given that one of the most vocal advocates for gun control in the aftermath of Sandy Hook has been a British citizen – Piers Morgan – who has used his platform on CNN to attack the second amendment, the contrast is illuminating. Despite the fact that it is virtually impossible for an average citizen to obtain a gun through legal channels in Britain, the rate of violent crime in the UK is higher per capita than the US and the highest in the world amongst “rich” countries aside from Australia, which also instituted a draconian gun ban in the 1990′s. Preventing law-abiding people from owning guns clearly has no impact on violent crime, and if anything causes it to rise because the criminals know their victims will not be able to defend themselves. In addition, you are more than twice as likely to be a victim of knife crime in the UK than you are a victim of gun crime in the United States, but there is no media debate about banning kitchen knives. Despite virtually all handguns being outlawed in 1996 following the Dunblane school massacre in Scotland, with law-abiding people people rushing to turn in their firearms, over the next decade gun crime in the UK more than doubled. This proves that while law-abiding citizens willingly disarmed themselves, criminals were unfazed by the new laws and continued to use guns illegally. Therefore gun control only disarms innocent people since criminals do not follow the law. In summary, despite a widespread ban on gun ownership in the United Kingdom, it is the most dangerous place to live in terms of violent crime in the entire western world. Another country where violent crime and rapes are soaring is India, recently in the news because of the tragic death of a woman who was gang raped and savagely beaten in New Delhi. India has a gun control policy just as draconian as the United Kingdom, and despite Indian women begging the police to allow them to own firearms for personal protection, the vast majority of license applications have been rejected, leaving women defenseless against rapists and murderers. Now let’s take a look at a country which is geographically-speaking a stone’s throw away from the United Kingdom – Switzerland. With a population of just six million, Switzerland has 2 million publicly-owned firearms. Despite the fact that guns are everywhere in Switzerland and are a deeply-ingrained part of Swiss culture, the gun crime rate “is so low that statistics are not even kept,” reports the BBC. Indeed, with its population of law-abiding armed citizens, Switzerland is one of the safest countries to live in the entire world, with homicide rates at just 2.2 people per 100,000. So the UK is one of the most dangerous places to live in the developed world, while Switzerland is one of the safest, and yet Switzerland is a nation of gun owners. How then can we possibly conclude that gun control reduces violent crime when in virtually every instance it has proven to have the opposite effect? The figures clearly show that gun control does not reduce violent crime, and in fact only emboldens criminals to use guns illegally – safe in the knowledge that their victims have been disarmed courtesy of government legislation. Recent cases involving law abiding citizens in America, largely ignored by the mass media, who have exercised their second amendment right to prevent a crime and save lives, emphasize this reality, including an incident just two days after the Connecticut massacre during which a gunman entered a theater in San Antonio after killing his ex-girlfriend but was shot dead by an off duty policewoman. In addition, last month’s mall shooting in Oregon was brought to an end when 22-year-old Nick Meli, who has a concealed carry permit, pulled a gun on the killer, prompting masked shooter Jacob Tyler Roberts to use his final bullet on himself. In both cases, the media virtually ignored the fact that potential massacres were stopped by responsible Americans using firearms. Similar cases emerge on a weekly basis, including another incident on Friday where a woman in Atlanta defended herself and her young children against an intruder by using a legally owned firearm. The National Safety Council notes that guns are used some 2.5 million times a year in self defense against criminals, meaning that firearms are utilized to protect innocent lives in 80 times more cases than they are used to end lives. These figures, not just from America but from other countries around the world, send a clear and consistent message – gun control actually increases violent crime, more guns in the hands of law-abiding citizens equals less crime, and only by allowing responsible, law-abiding people to be armed and not by disarming the victims can we hope to prevent or lessen the scale of future tragedies like the Sandy Hook massacre.